Michael Leon Wilson, son of Joseph and Minnie Wilson, was born April 17 1957, in Blackstone Virginia. 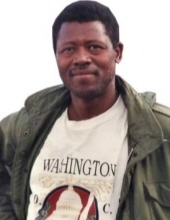 He entered eternal rest at Washington Hospital Center in Washington, DC on December 19, 2018 at the age of 61. At an early age Michael accepted Jesus Christ as his Lord and Savior at Spring Hill Baptist Church. He attended Nottoway High School, Crewe, Virginia. Michael lived his early adult years in Blackstone enjoying his favorite hobbies of fishing and basketball. He was employed for several years at Colonial Trail Restaurant in Blackstone, Virginia. He later moved to New York, NY. Michael lived life to the fullest. Michael was preceded in death by his father Joseph Wilson; his Maternal Grandmother, Rebecca Lee; and his Maternal Grandfather, William Stokes. Michael leaves to cherish his memories, his mother, Minnie Inez Wilson; sisters, Janice Shaw of Victoria, VA, Barbara Brown (Anthony), Angelene Wilson, Teresa Wilson, Mary Alice Booker (Charles, Sr.) and Shelia Jones (Robert, Sr.) all of Blackstone; three brothers, Joseph Jr., Kenneth and Kendall Wilson, all of Blackstone. He also leaves a host of nieces, nephews, great nieces, great nephews, other relatives and friends. Funeral Services Saturday, December 29, 2018 at 12:00 noon at Springhill Baptist Church, Blackstone. Interment church cemetery. To plant a tree in memory of Michael Leon Wilson, please visit our Tribute Store. "Email Address" would like to share the life celebration of Michael Leon Wilson. Click on the "link" to go to share a favorite memory or leave a condolence message for the family.